…for distinguished bravery in action against hostile Sioux Indians, near the Catholic Mission, on White Clay Creek, South Dakota, continuing on duty though painfully wounded. Private Marvin C. Hillock was assigned to Captain Charles A. Varnum’s B Troop sometime prior to the regiment’s departure from Fort Riley to South Dakota in November 1890. Being in B Troop, likely placed Hillock on the ‘V’ shaped angle of sentinels surrounding the council of Indians during the disarmament on Wounded Knee on the morning of December 29, 1890. This position would put him in the thick of the fight at the opening volley. Twelve of the forty-three soldiers in B Troop were casualties that day, including the company’s First Lieutenant, John C. Gresham. Of those twelve, five where killed outright and two more died later of their wounds. This was the second highest casualty rate of the ten line companies at Wounded Knee, including the artillery and Indian scouts. Only K Troop, making up the other leg of the ‘V’, had experienced more casualties, sixteen, including six killed in action and two that died of wounds. 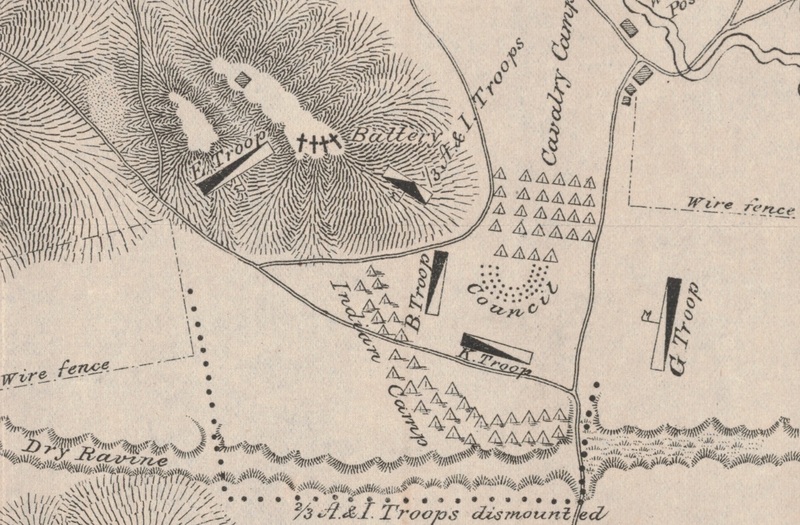 Hillock came through the battle unscathed but was not so fortunate the following day at the battle on White Clay Creek. There Hillock was one of two soldiers from B Troop wounded, the other being Private William S. Kirkpatrick. Captain Varnum recorded in the company muster roll that Private Hillock was sick in quarters suffering from a gunshot wound to his left foot received in action on December 30. (Click to enlarge) Inset of Lieut. S. A. Cloman’s map of Wounded Knee depicting the scene of the fight with Big Foot’s Band, December 29, 1890. Private Hillock’s actions in both battles clearly made an impression on his commander and fellow soldiers, as he was one the first troopers awarded the Medal of Honor from that day, receiving the Nation’s only medal at that time on April 16, 1891. However, there is some confusion for which battle, Wounded Knee Creek or White Clay Creek, Private Hillock was recognized. 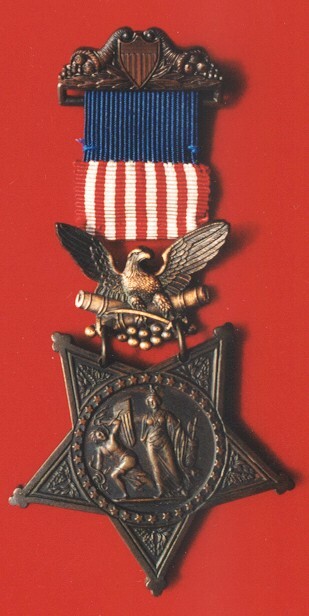 According to the 1917 Medal of Honor Review Board convened to determine the validity of all medals presented to that date, Private Marvin C. Hillock was awarded the Medal of Honor for “distinguished bravery” on December 29, 1890, while serving with Troop B, 7th Cavalry, in action at Wounded Knee Creek, South Dakota, and the Congressional Medal of Honor Society recognizes Hillock as a recipient from that engagement. However, Captain Varnum’s recommendation dated March 17, 1891, clearly stated that he recommended Hillock for actions at White Clay Creek on December 30, 1890. 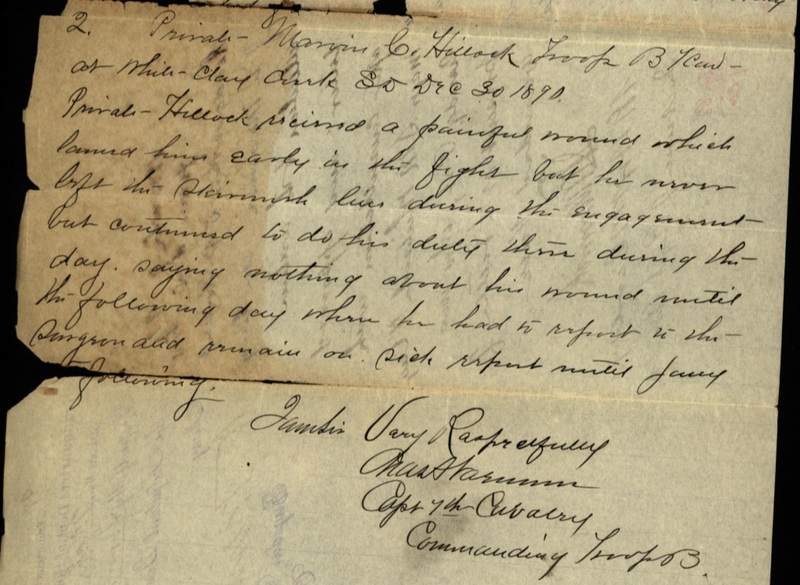 Varnum cited both Sergeant James H. Ward and Hillock in the same letter in two separate paragraphs beginning both recommendations with the appropriate date and engagement for each soldier: Sergeant Ward at Wounded Knee and Private Hillock at White Clay Creek. (Click to enlarge) Captain Charles A. Varnum clearly recommended Private Marvin Hillock for actions at White Clay Creek, not Wounded Knee. Private Marvin C. Hillock Troop B 7 Cav.–at White Clay Creek, S.D. Dec. 30, 1890. Private Hillock recieved [sic] a painful wound which lamed him early in the fight, but he never left the skirmish line during the engagement but continued to do his duty there during the day, saying nothing about his wound until the following day when he had to report to the surgeon and remain on sick report until Jan’y [22d] following. The War Department created the confusion when forwarding for approval both Sergeant Ward’s and Private Hillock’s recommendations on the same memorandum. The summation of the two recommendations only listed Wounded Knee for both troopers, and Major General John M. Schofield’s endorsement as the Commanding General of the Army perpetuated this error. The Department recognized the confusion the following December when finalizing its list of honorable mentions from the campaign. The Adjutant General’s Office sent a telegram to Fort Riley asking, “Was the recommendation for medal of honor for Private Hillock… intended for Wounded Knee or Mission Fight.” General Order 100 correctly stated “For distinguished bravery in action against hostile Sioux Indians at White Clay Creek,” but to this day the Department’s official record still erroneously indicates Hillock’s medal was for action at Wounded Knee. Marvin Charles Hillock was the fifth of seven boys born to Robert and Mary Hillock about June 1867 at Port Huron, St Clair County, Michigan. His father, Robert Hillock, was born about 1831 in Caledon, Peel County, Ontario, Canada. He was the son of Alexander and Catherine (Daly) Hillock, both immigrants from Ireland. On 8 June 1858 at Toronto Gore, Peel County, Ontario, Robert married Mary Jean Gough. She was born about 1838 at Caledon, Ontario, the daughter of John and Dellia (Garaghty) Gough, also both Irish immigrants. In 1861, Robert and Mary Hillock were living in a framed one-story house in Caledon, Peel, Canada West, with their two-year-old son, Dennis, and one-year-old son, Alex, and were registered as Roman Catholic. By 1870 they had relocated to Burtchville, St Clair, Michigan, with Robert working as a tanner having immigrated to the United States about 1863. Their family had grown to five boys, eleven-year-old Dennis, ten-year-old Alexander, eight-year-old Robert, five-year-old John Joseph, and three-year-old Marvin with the two youngest sons having been born in Michigan and older sons in Canada. The Hillocks still resided in Burtchville, Michigan, in 1880 with Robert working as a farmer and the family having grown to seven children with the addition of two more sons, Thomas, born about 1870, and Edward, born about 1873. The eldest four boys were working as laborers and the three younger were attending school. Robert Hillock died sometime between 1880 and 1900, his precise date of death and final resting place are unknown. On October 14, 1888, the second eldest son, Alexander Hillock, died at the age of twenty-seven at Bay City, Bay, Michigan. At the time of Alexander’s death, his parents, Robert and Mary Hillock, were listed as residing in the Dakota Territory. Marvin’s younger brother, Thomas, headed to Detroit in September 1889 to enlist in the Army. He ended up serving in Battery C, 3rd Artillery Regiment at Washington Barracks, District of Columbia. Following his younger brother’s lead, on March 11, 1890, Marvin Hillock enlisted in the Army at Detroit, Michigan, for five years. The recruiting officer, Lieutenant Lockett, listed him as twenty-two years and nine months in age, a farmer born at Port Huron, Michigan, with blue eyes, red hair, a fair complexion, and standing five feet, six inches tall. After recovering from his wound at White Clay Creek, Hillock was discharged from the Army on April 2, 1892, at Fort Riley, Kansas, after serving two years on his five year-enlistment. Hillock was drawn back to the military sixteen months later, enlisting at Chicago for another five-year stint on August 5, 1893. His recruiting officer, Captain Hoyle, recorded Hillock as twenty-three years two months in age, which appears to be three years younger than his actual age, with an occupation of miner, a profession that Hillock continued to pursue for the remainder of his life. During his second enlistment, Hillock was assigned to F Troop, 3rd Cavalry, which at the time was located at Caldwell, Kansas, and later Pond Creek, Oklahoma, under the command of Captain George A. Dodd where the unit was participating in the opening of the Cherokee Strip, part of the Oklahoma Land Rush of 1893. This was another controversial episode where the U.S. troops were alleged to have killed various homesteaders or ‘sooners.’ Despite the negative press the Army received, an investigation of the incident reported that the conduct of the troop was “very good. The citizens are glad to have the troops with them and petitioned the major-general commanding the department to allow them to remain here for the moral effect.” Whatever his role in this incident, Hillock’s enlistment record states that he deserted from his unit on January 11, 1894, just five months after enlisting. If Marvin Hillock was following his younger brother, Thomas, by entering the military, it was Thomas that followed Marvin’s lead by deserting the Army. Thomas was discharged from his first enlistment with the 3rd Artillery as a corporal on Christmas Eve 1892. He enlisted again a year later not long after Marvin enlisted a second time. Thomas was assigned to Battery C, 4th Artillery, but like Marvin, deserted from his unit in August 1894. At about the time that Thomas was deserting from his unit, the youngest of the seven Hillock brothers, Edward, was enlisting at Portland, Oregon, on August 4. He was assigned as a teamster in Company G, 14th Infantry, at Vancouver Barracks, Washington, but was discharged for disability after only five months. Pierre, S. D., Nov. 18.–Articles of incorporation were filed today for the Black Hills and Wyoming Gold Mining Company, with a capital stock of $1,500,000 headquarters at Lead City. Incorporators, John P. Hillock, James P. Wilson, Lead City; O. N. Ainsworth, Spearfish. That Hillock was known as a Medal of Honor man in Lead, South Dakota, is evident from an article printed in the Lead Daily Call in the summer of 1896. Article in the Lead Daily Call detailing Marvin C. Hillock’s Medal of Honor. …Mr. Hillock is so modest that but few, only of his intimate friends, know him to be the possessor of such a treasure, and it was by the merest accident that The Call caught on to him having such a valuable medal in his possession. But three of these medals were issued, one being to Mr. Hillock, another to J. W. Martin, the other to Corporal Ira Renard. Hillock and Martin were both members of B troop, 7th, while Renard belonged to I of the Second artillery. These three soldiers handled the Hotchkiss at the Wounded Knee fight, and it was they who turned the gun on the tent wherein an Indian was doing such fatal execution with his little gun. But it was on the following day that these three same boys exhibited their bravery to a degree that called for admiration. They were out reconnoitering, being accompanied by Capt. Barnard and Lieut. Gresham, when suddenly they were surprised by a volley which brought down both officers. The boys stood their ground and when the skirmish was over seven “good” Indians lay prostrate on the earth. The officers were wounded, and afterwards recovered, and both are yet in the service. The Indians were bent on getting their scalps, and but for the bravery of the boys who received these medals they would undoubtedly have done so. But a short time elapsed after the first firing until the hills were covered with Indians, the battle being known as the “Mission fight,” but the boys stood their ground and the incessant firing brought to their rescue one troop of the 7th and one troop of the 9th cavalry, both under command of that gallant soldier Guy V. Henry, of the 9th. But for the timely assistance of these two troops the boys would have been taken in and with them the two wounded officers. As we have before stated Mr. Hillock does not stand on the street corners and display his medal or boast of his bravery, but he possesses something, in the shape of the gold badge which he modestly exhibits, that any young man might well feel proud of. The story of the Army award recipient turned deserter is erroneous on a number of facts, including names. There was no Corporal Ira Renard at Wounded Knee or White Clay. There was a Private James W. Martin, but he was in D Troop, not B Troop to which Hillock was assigned. The Hotchkiss guns fell under the control of Capt. Capron’s Light Battery E, 1st Artillery. There is no indication that troops of the 7th Cavalry took control of any of the four Hotchkiss guns during the course of the battle. Capt. Barnard likely is a reference to Capt. Varnum, who commanded B Troop. Neither Varnum nor Lieut. Gresham were wounded at White Clay–The Mission Fight–although Gresham was slightly wounded at Wounded Knee when a bullet grazed his nose. There is no mention of Hillock being wounded. The notion that Privates Hillock and Martin saved the fictionally wounded Gresham and Varnum from being scalped at White Clay is preposterous. Although, one dead or unconscious soldier left on that field was severely mutilated after the soldiers withdrew from the ground. Unknown is whether this published tall tale was spawned from the imagination of Hillock, or from an over zealous reporter who was more interested in captivating readers than accurately reporting. Marvin’s name appears in the Omaha Daily Bee in 1897 under dubious circumstances, where he is listed as a miner. Lead, S. D., March 6.–(Special. )–Marvin Hillock, a well-to-do mine owner, living in this city, was arrested this week upon the charge of seduction upon promise of marriage, preferred by Sophie Nelson, a domestic, employed by Wolff Fink, the jeweler. Miss Nelson is soon to become a mother, and charges Hillock with being responsible for her condition. Hillock was bound over until Monday in the sum of $500, bail for which was furnished. If Hillock decides to fight the case, it will be highly sensational, for he is very prominent in mining circles, and well known throughout the entire Hills. The girl in the case is a comely young woman, and has always borne a good reputation. Miss Nelson’s ploy worked, as she and Hillock were married two days later. The following month Sophie gave birth to a son, Franklin Joseph, on 6 April. Marvin’s first child lived just short of two years, succumbing to pneumonia on March 14, 1899, at Lead. According to the death announcement, Marvin and Sophie Hillock were still married. Sophie’s fate remains a mystery, but the marriage did not seem to last much beyond the death of her son. Marvin appears again later in 1897 in the Engineering and Mining Journal this time with questionable mining practices. Polo Creek, Lawrence County, South Dakota.–Claim jumpers have been busy in this neighborhood of late, but two of their number, Ernest LaVenture and Marvin Hillock, came to grief last week, receiving a thorough thrashing at the hands of an indignant miner, and the practice is likely to fall into disrepute. DEADWOOD, S. D., April 15.–(Special. )–About two months ago, Marvin and John Hillock, two old-time mine owners of this city, brought in a report from their mining ground that they had made a remarkable discovery of sylvanite ore. They exhibited very rich samples of the ore on the streets and had assays made which went as high as $60,000 to the tone gold. There was great interest in the new find. The brothers placed an armed guard at the entrance of the tunnel and very few people were permitted to go in and see the gold strike. A week ago, a Colorado man got permission to enter the tunnel and he obtained a sample of the rich ore. This he pronounced genuine Cripple Creek, Colorado, phonolite ore, and he stated to certain Deadwood parties that the ore came from a depth of at least 600 feet. This statement aroused the suspicion of some parties who had put money into the find and they then compelled the two brothers to sink a shaft on the vein. At a depth of four feet, the ore was as rich as ever. The brothers had dug the hole and then salted it before the parties arrived. The two brothers have suddenly disappeared. The vein has been examined closely and it was found pounded full of small pieces of sylvanite ore that came from Boulder, Colorado. Water had then been poured over the salted place and allowed to freeze, which gave it the appearance of being a solid body of ore. It is now known that two large boxes of sylvanite ore specimens were purchased at Boulder, Colorado, valued at $1,200. This rock was all given away to Deadwood and Lead people as samples from the Hillock mine. A third party named Ernest LaVenture, has been arrested and jailed and the officers are hot after the Hillock brothers. These brothers put through a similar deal a long time ago, in which they were successful. 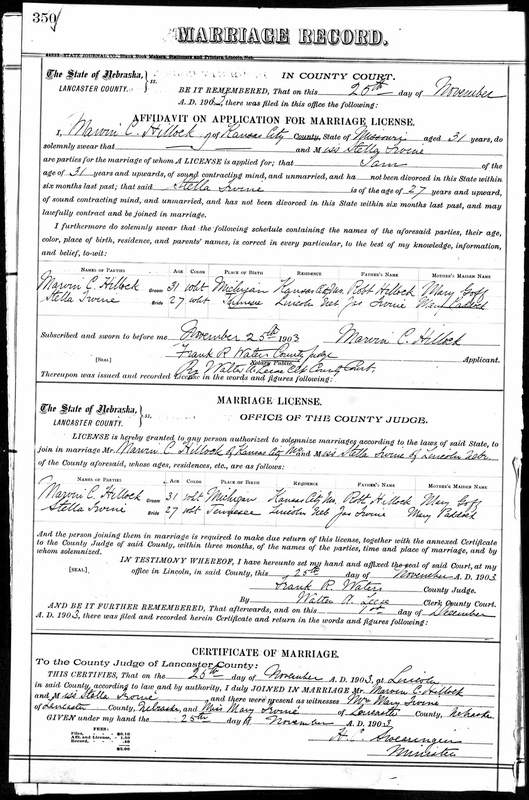 (Click to enlarge) 1903 marriage certificate of Marvin C. Hillock to Stella Irvine. Hillock next appears in 1903 in Lincoln, Nebraska, where he married twenty-seven-year old Stella Irvine. Likely born in Dickson, Tennessee, and raised in Shenango, Pennsylvania, by 1900 Stella was living in Lincoln with her widowed mother and two siblings. On the marriage certificate, Hillock was listed as a resident of Kansas City, Missouri. The marriage did not last, and by 1910 Stella was working as a telephone operator at the Hot Springs Hotel in Paso Robles, California, where she listed herself as a widow on the census. Stella was living in San Francisco in 1930, but the record runs cold after that. Sometime after this second marriage, Marvin Hillock relocated to Ontario. The final documentation of his whereabouts being his marriage certificate in 1911 when he was a resident of Webbwood, Sudbury, Ontario, Canada, and listed himself as a thirty-seven-year-old mining engineer, although by all other documentation he would have been about forty-four years old. On May 23 of that year, Hillock married Catharine Shanahan, a twenty-nine-year-old Roman Catholic woman working as a domestic from Renfrew, Ontario. She was the ninth of ten children of John and Ellen (Culhane) Shanahan, he being a farmer whose parents immigrated to Canada about 1845 when he was an infant. The Shanahan family had been congregants of the Mount Saint Patrick Catholic community since its establishment in Renfrew. Marvin and Catharine Hillock had one child, George, who was born in 1912. George was a farmer in Lanark, Renfrew, and died in July 1998. He was buried in the Precious Blood Cemetery in Calabogie, Renfrew. Catharine died on January 19, 1933, at the Ontario Hospital in Kingston after almost two years treatment for chronic intestinal obstruction. She was listed as a widow at the time of her death, and was buried two days later at the township of her residence, Ashdad, Renfrew County. Unfortunately, a search of the Renfrew Catholic cemeteries, to include the Precious Blood Cemetery where her son is buried and the Holy Well Cemetery where her parents are buried, failed to locate her grave. Marvin’s younger brother, Edward, died in 1913 in a flash flood in Ely, White Pine, Nevada, where he was working as a salesman in dry goods. ELY, Nev., Aug. 26.–One man was drowned this afternoon when a well of water from a cloudburst swept down Murray creek, which flows through Ely. The flood rose above the banks of the stream and inundated a portion of the business and residence section to a depth of several feet. When the torrent struck the corner of the Northern hotel, it quickly found its way into the basement, where C. D. Vautrin and Edward Hillock happened to be. The water poured down the stairway in such volume that they were unable to make their exit. Axes were obtained and a hole in the floor of the barroom was cut out, through which both men were dragged. Efforts to resuscitate Hillock failed. Edward was buried in the Old Holy Cross Cemetery in Santa Cruz, California. In 1920, Marvin’s mother, Mary Jean Gough Hillock, died in Detroit, Michigan, where she was living with her son, John, his wife, and their four children. Mary Hillock was buried with her youngest son, Edward, in Santa Cruz. Cemetery officials at the Old Holy Cross Cemetery were unable to find any other Hillock’s buried there. Marvin Hillock’s two older brothers, Dennis and John Joseph, both died in Detroit, Michigan, the latter in 1929 and the former in 1933. They were both buried in the Mount Olivet Cemetery in that city along with their wives. The date of deaths and final resting places of the two other brothers, Robert and Thomas, are undetermined. Marvin Charles Hillock’s date of death and final resting place remain unknown. He is one of three Medal of Honor recipients from the Battle of Wounded Knee–albeit that Hillock’s documented action occurred at White Clay Creek–whose ultimate fate is unrecorded, the other two being Matthew H. Hamilton and William G. Austin. The Medal of Honor Historical Society lists Hillock, Hamilton, and Austin as three of over 400 recipients lost to history. National Archives and Records Administration (NARA), Washington, D.C.; Returns from U.S. Military Posts, 1800-1916, Microfilm Serial: M617, Microfilm Roll: 1532. 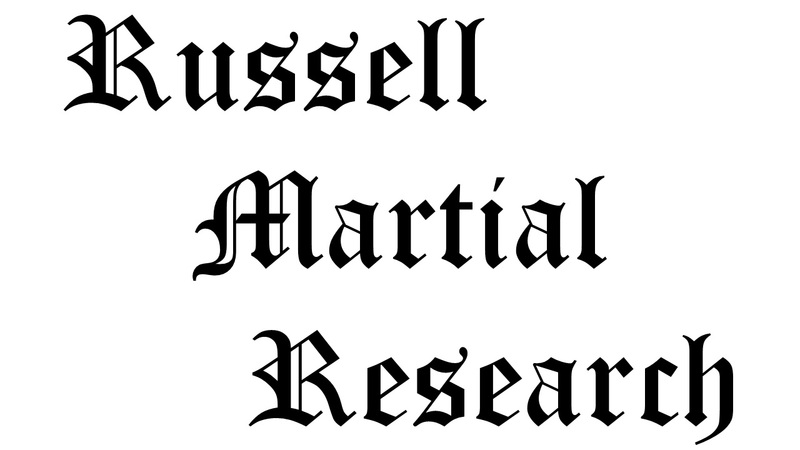 Statistics were compiled from the Seventh Cavalry Regiment’s monthly returns for December 1890 and January 1891; Adjutant General’s Office, Muster Rolls of Regular Army Organizations, 1784–Oct. 31, 1912, 7th Cavalry, Troop B, Oct. 31, 1890–Dec. 31, 1890, pages 5 and 6; Records of the Adjutant General’s Office, 1780’s-1917, Record Group 94, National Archives, Washington, D.C.
 Secretary of War, “General Staff Corps and Medals of Honor,” United States Congress, Congressional edition, Volume 7609, (Washington: Government Printing Office, 1919), page 419. Adjutant General’s Office, Medal of Honor file for Marvin C. Hillock, Principal Record Division, file 3466, Record Group: 94, Stack area: 8W3, Row: 7, Compartment 30, Shelf: 2; C. H. Carlton to Adjutant General’s Office dated 22 April 1891, Source data: The National Archives, Principal Record Division, file 6776, Record Group: 94, Stack area: 8W3, Row: 7, Compartment 30, Shelf: 3. Research conducted by Vonnie S. Zullo of The Horse Soldier Research Service. Ancestry.com and Genealogical Research Library (Brampton, Ontario, Canada).Ontario, Canada, Marriages, 1801-1928 [database on-line]. Archives of Ontario; Series: MS248_23; Reel: 23; Ancestry.com and The Church of Jesus Christ of Latter-day Saints, 1861 Census of Canada [database on-line] (Library and Archives Canada), Ottawa, Ontario, Canada, Census Returns For 1861, Roll: C-1062; Ancestry.com and The Church of Jesus Christ of Latter-day Saints, 1880 United States Federal Census [database on-line], Year: 1880, Census Place: Burchville, St Clair, Michigan, Roll: 604, Family History Film: 1254604, Page: 38C, Enumeration District: 367, Image: 0077. Ancestry.com, Michigan, Deaths and Burials Index, 1867-1995 [database on-line] (Provo, UT, USA: Ancestry.com Operations, Inc., 2011), Original data: “Michigan Deaths and Burials, 1800–1995.” Index. FamilySearch, Salt Lake City, Utah, 2009, 2010. Index entries derived from digital copies of original and compiled records. Ancestry.com, U.S. Army, Register of Enlistments, 1798-1914 [database on-line], Provo, UT, USA: Ancestry.com Operations Inc, 2007, Original data: Register of Enlistments in the U.S. Army, 1798-1914, (National Archives Microfilm Publication M233, 81 rolls), Records of the Adjutant General’s Office, 1780’s-1917, Record Group 94, National Archives, Washington, D.C.
 United States Congress, The Executive Documents of the House of Representatives for the First Session of the Fifty-Third Congress, 1893, (Washington: Government Printing Office, 1893), page 7; Ancestry.com. U.S. Army, Register of Enlistments, 1798-1914 [database on-line]. Provo, UT, USA: Ancestry.com Operations Inc, 2007, Original data: Register of Enlistments in the U.S. Army, 1798-1914, (National Archives Microfilm Publication M233, 81 rolls), Records of the Adjutant General’s Office, 1780’s-1917, Record Group 94, National Archives, Washington, D.C.
 Ancestry.com. U.S. Army, Register of Enlistments, 1798-1914 [database on-line], Provo, UT, USA: Ancestry.com Operations Inc, 2007, Original data: Register of Enlistments in the U.S. Army, 1798-1914, (National Archives Microfilm Publication M233, 81 rolls), Records of the Adjutant General’s Office, 1780’s-1917, Record Group 94, National Archives, Washington, D.C.
 St. Paul Daily Globe (19 Nov 1895), 5. “One of Three Medals,” Lead Daily Call, (Lead, S.D. : 12 Jun 1896), 8. “Arrest of a Rich Mine Owner,” Omaha Daily Bee (7 Mar 1897), Part I, 6. The Daily Deadwood Pioneer-Times (Deadwood, S. D.: 9 Mar 1897); The Daily Deadwood Pioneer-Times (Deadwood, S. D.: 16 Mar 1899). Sophie Nelson’s name is given variously as Sophie, Sophia, and Sofia. “Deadwood People Buncoed,” Nebraska State Journal (16 Apr 1900). San Francisco, California, City Directory, 1930, Image; 334, Page: 660. Ancestry.com, Nebraska, Marriage Records, 1855-1908 (Lehi, UT, USA: Ancestry.com Operations, Inc., 2017), County: Lancaster, Years: 1901-1904, Image: 1379. Ancestry.com and Genealogical Research Library (Brampton, Ontario, Canada), Ontario, Canada, Marriages, 1801-1928 [database on-line] (Provo, UT, USA: Ancestry.com Operations, Inc., 2010, Archives of Ontario), Series: MS932_154, Reel: 154; Ancestry.com, Ontario, Canada, Catholic Church Records (Drouin Collection), 1747-1967 [database on-line] (Provo, UT, USA: Ancestry.com Operations Inc, 2007), Original data: Gabriel Drouin, comp. Drouin Collection. Montreal, Quebec, Canada: Institut Généalogique Drouin; Ancestry.com, Census of Canada [database on-line] (Provo, UT, USA: Ancestry.com Operations Inc, 2006), Year: 1891, Census Place: Bagot and Blythfield, Renfrew South, Ontario, Roll: T-6366; Year: 1901, Census Place: Bagot and Blythfield, Renfrew (south/sud), Ontario, Page: 22, Family No: 186; Year: 1911, Census Place: 34 – Renfrew, Renfrew South, Ontario, Page: 18, Family No: 179. Murray Pletsch and Diane Dillon, Renfrew County, Ontario Gravemarker Gallery, http://freepages.genealogy.rootsweb.ancestry.com/~murrayp/renfrew/madawask/pbrc/page0002.htm accessed 4 Aug 2013; Ancestry.com. Ontario, Canada, Deaths, 1869-1938 and Deaths Overseas, 1939-1947 [database on-line], Provo, UT, USA: Ancestry.com Operations Inc, 2010, Original data: Archives of Ontario, Series: MS935; Reel: 464. The San Francisco Call (27 Aug 1913), 2. The Library of Michigan, Michigan Death Records, 1897-1920, Rolls: 1-302, Archive Barcode/Item Number: 30000008346607, Roll Number: 302, Certificate Number: 12232; Deadwood Pioneer-Times (Deadwood, S. D.: 28 Jul 1933, Fri), 2. Ancestry.com, Michigan, Death Records, 1867-1950 (Provo, UT, USA: Ancestry.com Operations, Inc., 2015), File Number: 169902 and File Number: 113689. “Lost to History,” Medal of Honor Historical Society of the United States, (http://www.mohhsus.com/lost-to-history), accessed 4 Aug 2013. Citation for this article: Samuel L. Russell, “Private Marvin Charles Hillock – A Lost Medal of Honor Recipient,” Army at Wounded Knee ( Sumter, SC, and Carlisle, PA: Russell Martial Research, 2013-2015, http://wp.me/p3NoJy-3), updated 2 Dec 2018, accessed date __________. This entry was posted in Award Recipients, Casualties, Enlisted and tagged 7th Cavalry, 7th Cavalry Regiment (United States), Cavalry, Drexel Mission, Fort Riley, Hillock, Medal of Honor, Sioux, Wounded Knee, Wounded Knee Creek, Wounded Knee Massacre. Bookmark the permalink. 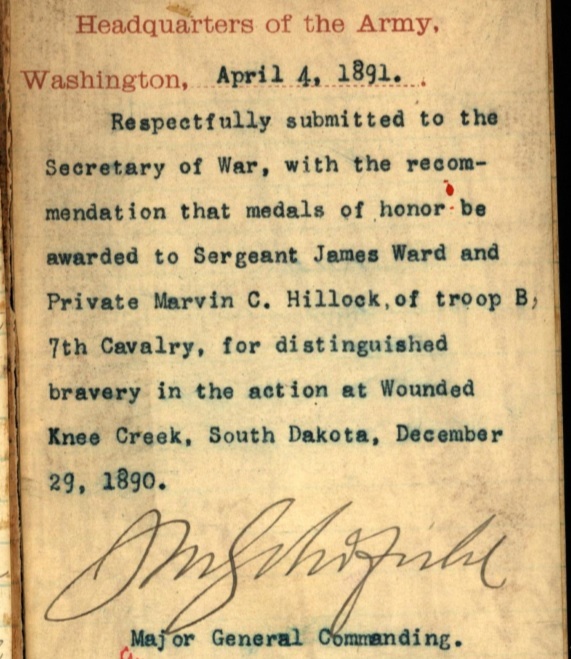 I recently came into possession of a digital copy of the majority of award recommendations stemming from the Pine Ridge campaign to include Captain Charles Varnum’s letter recommending Sergeant James Ward and Private Marvin Hillock for the Medal of Honor. I have updated this post on 13 Nov 2014 to include an excerpt from that letter. This is amazing! Thank you for this article and research of my distant relative! Updated with data pertaining to Hillock’s first marriage and first son. Andy… Thank you for the comment and providing this great lead. I spend a lot of time on Ancestry.com with each individual I research, and try to document all family ties. However, this marriage certificate eluded me, and I greatly appreciate you taking the time to point it out to me. Perhaps it may aid in finding Hillock’s final resting place. This article was updated this day with newly discovered information, including the 1896 Lead Daily Call article detailing Marvin Hillock’s Medal of Honor and details of his second marriage to Stella Irvine, based on documentation that was added to Ancestry.com in 2017. Thank you to Andy V for identifying the previously unknown marriage in an earlier comment. Stella Irvine Hillock was the sister of my wife’s Grandmother – Mary Irvine Cunningham. According to their brother William Irvine’s obituary, Stella was not alive in November of 1934. I assume she died in San Francisco. In April of 1909, Stella was present for my mother-in-law’s birth in Lincoln, Nebraska. This is according to my mother-in-law’s baby book. Stella may have been back home on a visit at the time. She presented her new niece with a dress. Fred… Thank you for taking the time to comment and provide those additional details of Marvin Hillock’s second wife. Every piece of detail may help in ultimately discovering where and when he died, and where he is laid to rest.